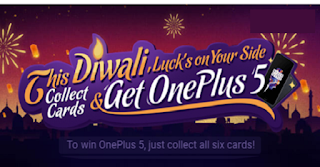 UC News Contest Win Free Paytm Cash & OnePlus 5 Mobile – Hello Friends, Hope you All are Enjoying our Free Recharge Tricks And Free Shopping Deals. Here is new Diwali offer on UC News app in which you will get a chance to win free paytm cash or OnePlus 5 mobile phone. UC News always comes up with awesome contest with exiting free prices like the previous Uc News contest this UC News contest is really exciting too. In the previous UC news Play Wheel & Win Motocycle and Rs 100 paytm Amazon Vouchers done successfully and now again you have a chance to win free paytm cash and brand new oneplus5 mobile. **How to Refer & Earn? That’s it now share with your friends and Earn more cards. How to Win the UC News Free Prize? * You should be UC News user and having Indian Nationality. * If you collect all the 6 different cards, you can definitely redeem the free OnePlus 5. * If you collect 3 card, you will have the chance to redeem the free paytm cash. How to Redeem Your Cards? When you get the all 6 different cards together huuy this will a great news for you, now just click on ” Redeem ” button on the homepage. Now fill all your personal information and claim your free OnePlus 5. If you win a any other prize, click on ” Fill in information ” button to complete your all contact information correctly.